It’s finally – finally! — football season! As the first weekend of college football wraps up, don’t expect any major changes when it comes to rankings, especially at the top. However, expect one major theme to be consistent with all top programs, there are still kinks to work out, and there is still work to do. Let’s start with the team in the pole position, the returning champions, the Florida State Seminoles. The Seminoles opened up with a nationally-televised game against the Oklahoma State Cowboys at the annual “Cowboys Classic” in AT&T Stadium in Arlington, Texas. Florida State won the game, 37-31, and the game was as tense as the final score indicated. Florida State, with their returning Heisman quarterback Jameis Winston, played like they were fighting off the rust of not playing a game since January, but they ultimately stepped up when it mattered. In the 4th quarter, with Oklahoma State looking for what would have been a go-ahead touchdown, the Noles were able to force and recover a fumble. After taking over possession, Winston quickly connected with Rashad Greene on a 50-yard touchdown pass to put the Seminoles back up by two scores. Winston delivered a great touchdown run, but his body of work was inconsistent. The team was described as “still a work in progress” after the game by coach Jimbo Fisher. Although the game wasn’t pretty, Florida State ultimately delivered when it mattered and should still be No. 1 next week. 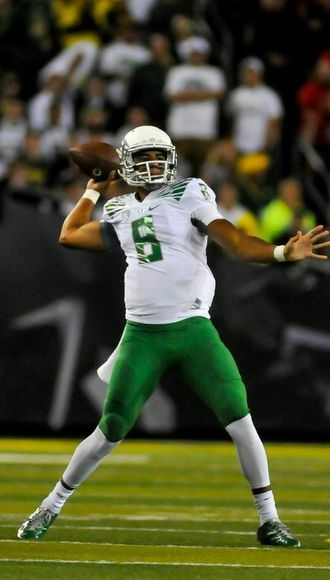 Marcus Mariota makes his first pitch for the Heisman Trophy. The Crimson Tide entered the Georgia Dome and the post-AJ McCarron era against West Virginia Saturday. McCarron had won back-to-back national championships, and replacing him will be a challenge. Coach Nick Saban gave fifth-year senior Blake Sims the start and he delivered an efficient performance, throwing for 250 yards, despite a few throws he wishes he had back, including one interception. Aided by a very strong run game, T.J. Yeldon and Derrick Henry combined for 239 yards and three touchdowns to help Sims earn the 33-23 victory in his first game as the starter. 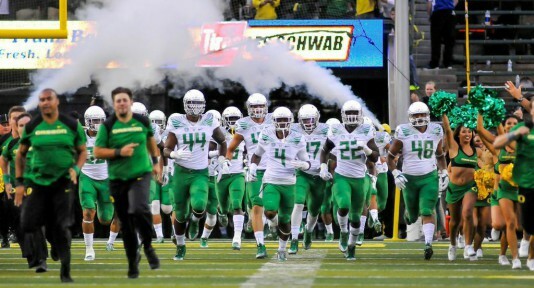 Oregon starts their season off with a bang. Rounding out the Top 5, No. 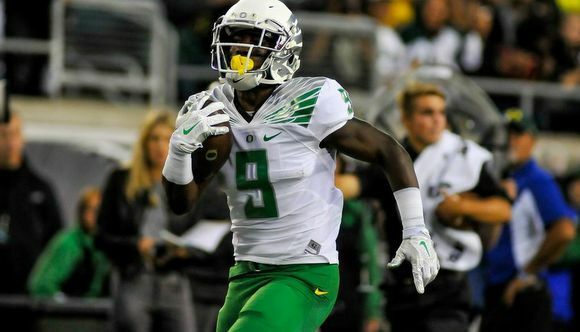 3 Oregon cleaned up against FCS South Dakota at home, winning 62-13, behind a nearly flawless performance by Marcus Mariota and a balanced running game. Fourth-ranked Oklahoma won at home, beating Louisiana Tech, 48-16, behind five rushing touchdowns and 436 total offense. Finally, Ohio State was rocked when they learned that starting quarterback and Heisman hopeful Braxton Miller would miss the entire season after re-injuring his throwing shoulder. The Buckeyes clearly missed him on Saturday, scoring only six points in the first half at home against Navy. They won, 34-17, however, by revving up the energy in the second half. J.T. Barrett, in his new role as starting quarterback, played well by throwing for 226 yards and two touchdowns. The Arizona schools both delivered impressive victories, with Arizona beating UNLV, 58-13, and 19th-ranked Arizona State defeating Weber State, 45-14. Anu Solomon, the ‘Cats new starting quarterback, put up video game-like stats in his debut, throwing for 425 yards and four touchdowns. Cal defeated Northwestern on the road, 31-24. The Golden Bears were up 31-7, at one point, but they allowed the Wildcats to make it a ballgame with a pair of quick touchdowns. Coming off of an abysmal 1-11 record, California is hoping that this is a step in the right direction for this season. Colorado however, lost to their in-state rivals, the Colorado State Rams, 31-17. The Buffs jumped out to a 10-0 lead, but surrendered 17 points in the final quarter. The Beavs sputtered at the start, but clamped down in the second half and were able to defeat the Portland State Vikings, 29-14, at Reser Stadium in Corvallis. OSU was actually down, 14-13, heading into halftime. Sean Mannion threw for 328 yards and a touchdown, and ran for one on the ground. Storm Woods was his usual impressive self, contributing 126 yards on 16 carries. Cardinal coach, David Shaw, says that this current group of offensive linemen could be the best group he’s ever assembled. Considering he has seen four of his linemen to the NFL since he took over, and with four new starters that’s a pretty bold claim. Given their 45-0 demolition of UC Davis, his prediction looks to have some legitimacy. Stanford dominated on both sides of the ball, amassing 461 yards while allowing the Aggies only 115, despite surrendering three turnovers. UCLA ventured east to Virginia to open up their season – a place where the Ducks won by 49 points last year – and their offense was lacking. The Bruins won, 28-20, with 21 points coming from the defense. The most glaring flaw in the Bruin offense was their lack of protection for their star quarterback Brett Hundley. The USC Trojans had perhaps the most impressive victory in the conference as they defeated the Fresno State Bulldogs, 52-13. Coach Steve Sarkisian has to be happy with his team’s first game. Trojan quarterback Cody Kessler was sublime in the opener, completing 25 passes for 394 yards and four touchdowns. Utah easily defeated Idaho State, 56-14, behind Travis Wilson and a balanced attack. Wilson, who has been plagued by injuries, threw for one touchdown and got another on the ground. 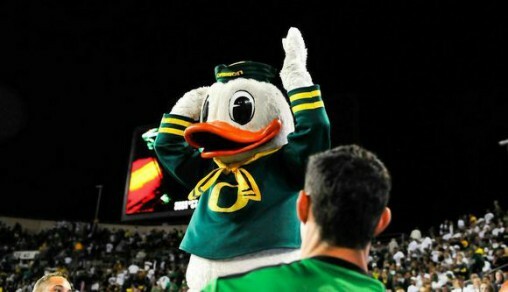 The Duck had plenty to smile about on Saturday. The Washington schools both had weekends to regret. Washington State saw victory slip through their fingers as the Cougs fell to the Rutgers Scarlet Knights, 41-38, in Seattle. Wazzu allowed 17 points in the fourth quarter, and were not able to deliver on a final drive, as they failed to get a first down with less than a minute to go. The Washington Huskies won beating Hawaii, 17-16, but it was not satisfying for new coach Chris Peterson. Washington did not score a single point in the second half putting their No. 25 ranking in jeopardy. Replacing Keith Price looks like a daunting challenge as new quarterback Jeff Lindquist threw for 162 yards and a 38% completion rate. The suspended Cyler Miles is expected to resume the helm of the Dogs for Game 2. College GameDay is coming to Eugene for the sixth consecutive year as the Oregon Ducks take on the Michigan State Spartans. Stanford and USC will face off next week, in a match up that could have serious Pac-12 Championship implications. If the Trojans can go into Palo Alto and knock off the Cardinal, Sarkisian should see his Trojan team in the Top 10. If Stanford is able to deliver another convincing victory, they will send a strong message to the conference and the nation that they are the team to beat in the Pac-12.